One of the fascinations of politics is that it unfolds over different time scales and at different levels. At one end of the scale are the personal and short-term; at the other, the matters of policy and principle, the history and development of ideas and of political movements. It is no surprise – given the symbiotic relationship between the practitioners of politics and of political reporting at any given moment – that the latter should habitually focus on the human-interest immediacy of the movements in individual political (and other) fortunes as they swing up and down. A case in point, last weekend, were the reports detailing the latest turn in the career of Peter Mandelson. The on-again off-again career of Lord Mandelson has provided much innocent entertainment for observers and a rich seam of copy for political commentators over the years. Yet, even so, it is surprising that the momentous events of recent weeks, which could herald a seismic transformation of the British political landscape, could have been viewed through such a narrow lens as was seen in the articles about Lord Mandelson’s latest transformation. It is true that Andrew Rawnsley ended his piece by briefly taking a wider perspective. The story was not, we were solemnly assured, one of unalloyed triumph. Peter Mandelson, we were told, genuinely cared about the Labour Party; its probably imminent demise was enough to turn the moment of his greatest success into a personal tragedy. We can readily agree that the demise of the Labour Party would be a tragedy – but surely a tragedy on a much greater scale than of one individual’s personal disappointment. It is doubtful, after all, if many tears will be shed for Lord Mandelson. Many – including all those whose allegiance to the Labour Party over recent years has been sorely tested, as well as those who have rejected Labour in favour of other promises to defend their interests – will see the noble Lord’s disappointment as being richly deserved. This is not a tragedy in the Shakespearian mould – a fatally flawed individual being undone by his inability to deny the power of the flaw that drives him. This is a tragedy that is likely to engulf an audience of millions, not just the leading members of the cast. Peter Mandelson is rather in the position of a ship designer whose vessel is revealed to be unseaworthy. He is consoled by observers with the assurance that they know that he did not mean it to ship water and, having arranged a lifeboat for himself, he then persuades the captain to stay on the bridge until the ship goes down. New Labour was, after all, Peter Mandelson’s project par excellence. He signed others up for the journey, and was initially fortunate enough to engage a brilliant skipper for the project. But, when a new captain proved to be no seaman, and the ship’s design faults meant that it foundered, disappointment is hardly an adequate sentiment. Those who entrusted their lives and life-chances to the seaworthiness of the vessel are entitled to require the designer to accept responsibility for, as well as disappointment at, the loss – and at the tragedy that is theirs. We are surely now in a position to judge the New Labour project, not according to the claims of its progenitors, but in the light of its likely final outcome. The project started, after all, with an overwhelming parliamentary majority, a popular and telegenic leader, a huge appetite for change and a real sense of excitement and anticipation in the country – all delivered by an overwhelming election victory. What has happened in the twelve short years since then is not the familiar story of a government that gradually loses support and – having used its opportunity to best effect but nevertheless having been exhausted by its efforts – is defeated by newly revitalised opponents. The immediate future facing the Labour Party is one of virtual extinction as a party of government. It may take a generation for Labour to recover – if it does so at all. In the meantime, the effective voice of the democratic left – the most consistent and reliable generator of change and reform we have – will be stilled. That is the real tragedy – not to be expressed in terms of individual careers – but in the destruction of one of the main forces in our democratic politics. Without it, our whole politics will be poorer. Faith in our democratic institutions and processes will be weaker. It is an outcome, a tragic outcome, that is the inevitable and predictable consequence of deliberately removing Labour from its value base and from its supporters. It is the direct result of treating power as an end in itself, of seeking power for the purpose of simply perpetuating it. New Labour not only failed to take a once-in-a-century opportunity; it turned its back on the idealism and creativity that, under President Obama, is reinvigorating American society and politics. This is the end result by which Peter Mandelson should be judged. You bet it’s a tragedy. I surely cannot have been the only reader to stop short mid-sentence at Nicholas Watts’ statement (Guardian, 13 January) that Tony Blair, Gordon Brown and Peter Mandelson had “wrenched Labour out of the wilderness”. The trio may have a number of achievements to their credit but the claim that they saved the Labour Party is – at the very least – open to question. It is precisely this kind of apparently casual but seriously misleading assertion which – unless challenged – can quietly become part of the accepted wisdom. History should not so easily be re-written. By the time Tony Blair became leader of the Labour Party in 1994, the Labour Party had substantially recovered from the nadir of its fortunes in 1983. That recovery owed a great deal to the leadership of Neil Kinnock. Under Kinnock, the Party had stopped the rot by 1987, had begun to divest itself of outdated policies, and had averted the real risk of falling behind the Liberals and Social Democrats. It had made further strides towards electability by 1992, and lost that election against many predictions only because – despite his substantial qualities – Kinnock could not seal victory by reaching out to that further range of middle-class opinion which had succumbed to the claims of the Tory media that he was nothing but a garrulous working-class boyo. It is very much to Kinnock’s credit that he recognised this and relinquished the leadership accordingly. Although I had my reservations about John Smith (and would have hoped for a more positive approach to the prospect of government), few can doubt surely that Labour was, under new leadership, heading for a comfortable victory at the next general election. The reasons for that optimism are, and were, not difficult to substantiate. General elections are almost always lost by the governing party. By 1994, the heyday of Thatcherism had long passed. Mrs Thatcher herself had been deposed by her own party some years earlier because the electorate was increasingly out of sympathy with her extreme views and policies. John Major had won an unlikely victory in 1992 but had failed to convince the electorate that he was made of the right stuff to lead the country. My own view is that when voters woke on the morning after the 1992 election, they were dismayed to realise that they were faced with another five years of Tory government. From that moment onwards, the die was cast. They were determined to secure a change of government at the next opportunity. It was certainly a signal achievement of the Blair/Brown/Mandelson “project”, (what later became “New Labour”), to persuade a Labour Party starved of electoral success that only a wholesale abandonment of its values and policies would guarantee victory. But this was a piece of sleight of hand. Not only was aping the Tories not needed; the electorate was actually very clear that it wanted change and a decisive move away from the Thatcherite agenda. This contention is supported by what actually happened in the 1997 general election. No one would doubt that Tony Blair was an electorally attractive candidate and that his appeal could well have added a margin to the Labour victory. But the real story of the 1997 election was that, after 18 years of right-wing and (especially after the debacle of the Exchange Rate Mechanism) incompetent government, Tory voters were disheartened and stayed at home. It was that lack of commitment, and the recognition that change was inevitable, not the abandonment of Labour principles, that accounted for the “landslide”. If, under a first-past-the-post system, your opponents stay at home, you win big. The real issue in assessing the role of the Blair/Brown/Mandelson trio in the Labour Party’s history is to ask, not what did they do to bring about election victory (which was largely assured by the time they arrived on the scene), but what did they do with power once the general election had delivered it to them. The answer to this question is much less flattering to them than Nicholas Watts’ claim about their “wrenching Labour out of the wilderness” would suggest. Every day that goes by makes it clearer that the contribution of New Labour in government has been to provide an unexpected, unwarranted and unnecessary prolongation to the Thatcherite era. New Labour has assiduously followed George Bush in foreign policy and Alan Greenspan in economic policy. 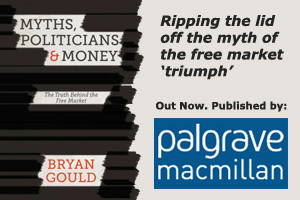 On the central question of politics – the relationship between government and the market – New Labour has settled decisively on the side of the “free” market, with the consequences we are now living with. We should be very careful about investing those responsible with encomiums of praise for allegedly saving what is valuable in left politics.